This year, the chess.com Speed Chess Championships will feature a series of three innovative esports bracket tournaments featuring the world's best chess players and a guaranteed combined prize pool of $100,000. 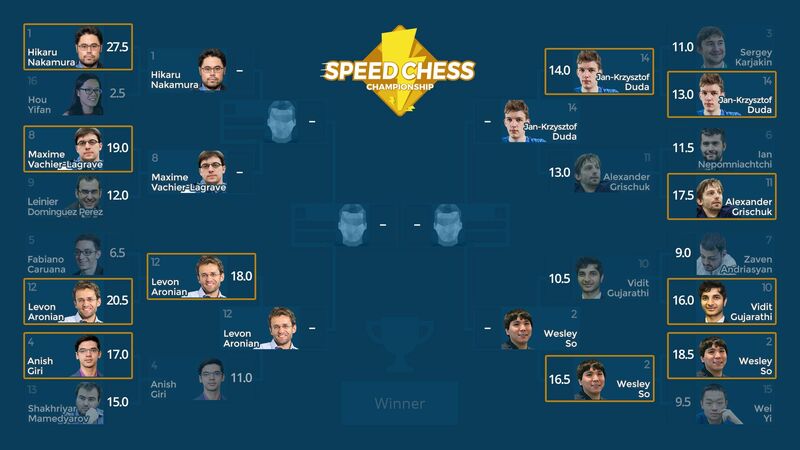 All 2019 Speed Chess Championship matches will be broadcast live with full chess-master commentary on Chess.com/TV and Twitch.tv/Chess. Round 1: 16 players, 8 matches, $16,000 prize pool. Round 2: 8 players, 4 matches, $12,000 prize pool. Two spots will be determined by two qualifier events. The Women's Speed Chess Champion and the Junior Speed Chess Champion will automatically qualify for the Speed Chess Championships. Each 2019 Speed Chess Championship match will feature 90 minutes of 5/1 blitz, 60 minutes of 3/1 blitz, and 30 minutes of 1/1 bullet chess. The bracket will be seeded 1-16 by March 2019 FIDE ratings at the conclusion of the open qualifier. The main bracket will be a single-elimination knockout. Anish Giri – world number 4 at time of invitation. Maxime Vachier-Lagrave – world number 7 at time of invitation. Ian Nepomniachtchi – world number 9 at time of invitation. For the official rules of the 2019 Speed Chess Championship, please visit this article. All 2019 Women's Speed Chess Championship matches will be broadcast live with full chess-master commentary on Chess.com/TV and Twitch.tv/Chess. Round 1: Open Qualifier, $1,000 prize pool. Round 2: 8 players, 4 matches, $8,000 prize pool. One spot in the 2019 WSCC will be awarded to the winner of the open qualifier on May 8th, 2019. Swiss tournament: 10 rounds, 3+1 blitz. Standard Chess.com tournament tiebreaks used only for the qualifier spot. No tiebreaks used for cash prizes; cash prizes split equally by point total. Must be titled and female to enter. Open to all who meet eligibility requirements, including those players invited to main bracket. If an invited player wins a qualifying spot, she gets the cash prize, and the qualification goes down to the next eligible finisher. Each 2019 Women's Speed Chess Championship match will feature 90 minutes of 5/1 blitz, 60 minutes of 3/1 blitz, and 30 minutes of 1/1 bullet chess. For the official rules of the 2019 Women's Speed Chess Championship, please visit this article. 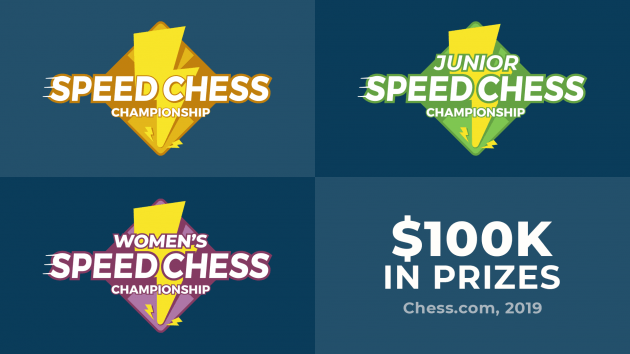 2019 brings the inaugural Junior Speed Chess Championships to chess.com. ChessKid is the official sponsor of the 2019 Junior Speed Chess Championship. ChessKid is the world's number one site for kids to learn and play chess! All 2019 Junior Speed Chess Championship matches will be broadcast live with full chess-master commentary on Chess.com/TV and Twitch.tv/Chess. Each 2019 Junior Speed Chess Championship match will feature 90 minutes of 5/1 blitz, 60 minutes of 3/1 blitz, and 30 minutes of 1/1 bullet chess. Wei Yi is one of the world's youngest grandmasters, and the youngest player ever to break 2700. Maghsoodloo won the Iranian Championship in 2017, and won the 2018 World Junior Chess Championship. Xiong is the United States' third youngest Grandmaster ever. Firouzja is consistently one of the highest rated bullet players on chess.com. Sam Sevian is the United States' youngest ever grandmaster. Can the talented Hungarian grandmaster win the first Junior Speed Chess Championship? After a successful season for the Australia Kangaroos, Sarana looks to win the JSCC. Jorden van Foreest has won many accolades in his young chess career. He is also the Netherlands' youngest ever grandmaster. The 2017 World Junior Champion looks to make a big splash in the JSCC. Esipenko's most famous win came against Karjakin in the 2017 World Rapid Championship. The Pittsburgh Pawngrabbers' PRO Chess League star is also the United States' second youngest grandmaster. The 2014 U10 world champion looks to make his mark on the JSCC. Can the winner of the 2017 World Youth Champion string a few upsets together to win the inaugural JSCC? Smirnov has represented Australia in three Olympiads, and famously took Karjakin to tiebreaks in the 2017 World Cup. Luca Moroni is currently the second strongest player in Italy. Pragg is the youngest member of this year's field, and is the fourth youngest player ever to reach grandmaster. For the official rules of the 2019 Junior Speed Chess Championship Sponsored by ChessKid, please visit this article. All 2019 Speed Chess Championship Qualifiers will be broadcast live with full chess-master commentary on Chess.com/TV and Twitch.tv/Chess. 2 Open qualifiers: both have $5,000 prize pools. Two spots will be determined by two open qualifier events. Must be titled and rated 2500 or more in Chess.com blitz to enter. Open to all who meet eligibility requirements, including those players invited to main bracket. If an invited player wins a qualifying spot, he gets the cash prize, and the qualification goes down to the next eligible finisher. More information and results for the 2018 Speed Chess Championship can be found here.